Order by the case, save on shipping! 72 pieces = case. Heavyweight T-Shirts - Jerzees© or Hanes© or comparable name brand (50% Cotton/50% Poly). 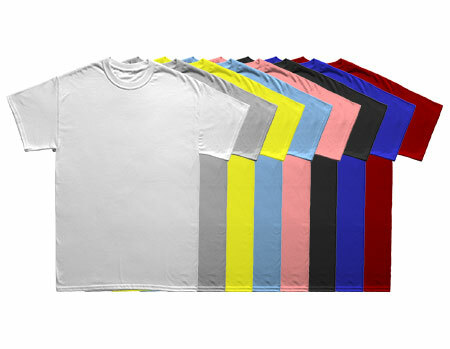 These name brand 50/50 (cotton/poly) shirts are the best choice when printing with digital heat transfers, such as inkjet, laser and CLC printers. The heat transfer paper coating bonds to the fibers of the shirt and this gives the final product excellent durability and washability. Keep in mind the quality of the heat transfer paper and the inkjet or laser printer settings play an important roll in this. Keep in mind we have only tested the heat transfer papers that we offer. Your results can vary with other transfer paper brands. The durability of your final product has everything to do with the quality of the transfers, inks or toners and proper application. If you need guidance please call us first!